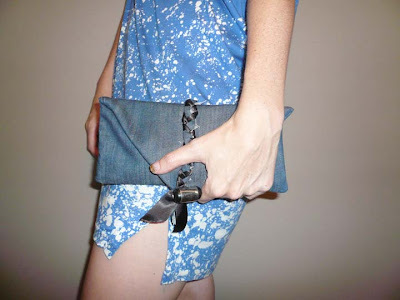 Jessica Taft Langdon is back with another quick and pretty project, this time taking on denim! I recently bought a pair of second hand jeans that fit me perfectly… but were about two inches too short. No problem, I definitely could use a new pair of shorts, perhaps even more than a full length pair of jeans, since the temperatures are getting quite warm here in NYC. Cut the leg off of your jeans. Then cut off the factory-made hem at the bottom. 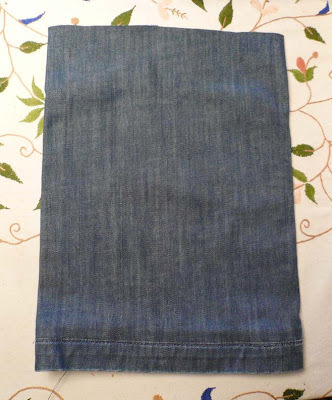 Turn your pant leg inside out, and sew one end of your pant leg closed at the bottom. Then double fold the top edge into itself, and pin. 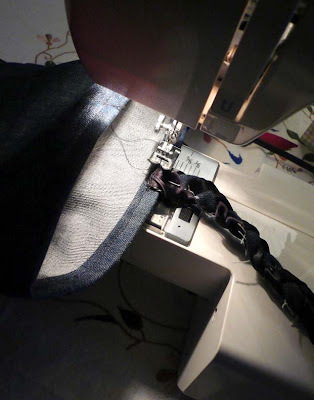 Stitch along the topline of your bag where you’ve pinned to create a hem. 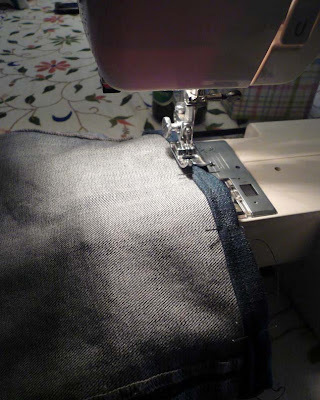 Remove your bag from the sewing machine and turn it right side out. At the closed bottom of the bag, you can create cleaner, squarer corners by pushing something small and thin (like a pencil, or seam ripper) into each corner from the inside. 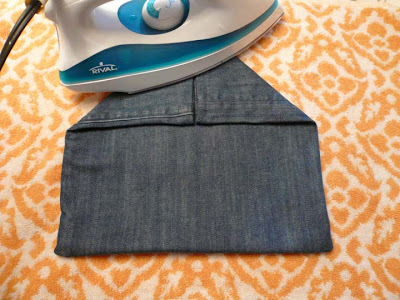 Then, fold the top two corners in to meet at the middle and press with a hot iron. 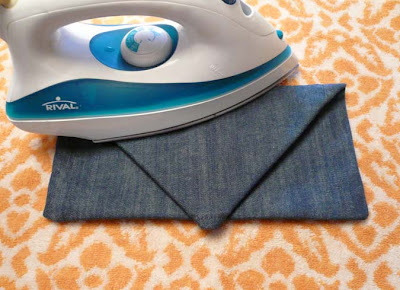 Fold the triangular shape you’ve just made onto itself, to create an envelope shape, and press this fold with the iron. 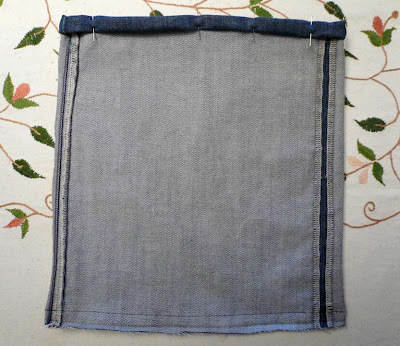 Cut a strip of denim from the remaining leg of your jeans. 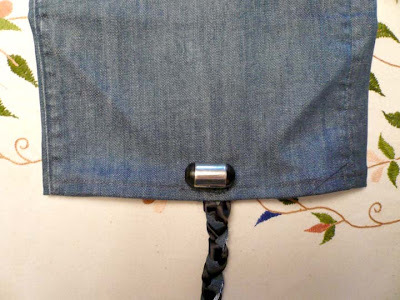 Cut one of the hems off of your denim loop,so that it lies flat. 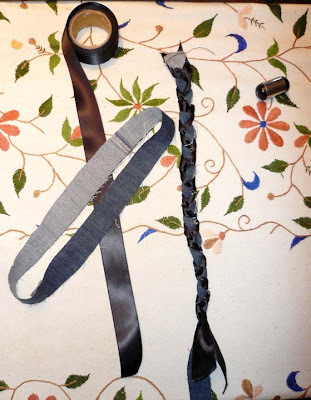 Cut two pieces of ribbon, trim or contrasting colored fabric of your choice (I used some black satin ribbon), and sew the ends of all three together at the top. Braid the three strips together, and stitch them together at the bottom, so that your braid doesn’t come undone. Leave a little length at the end,as shown. The photo above shows the materials on the left, and the finished product on the right. Fold the shorter end of your braided piece under itself, and pin it directly in the center, so that its edge lines up with your hemmed edge. 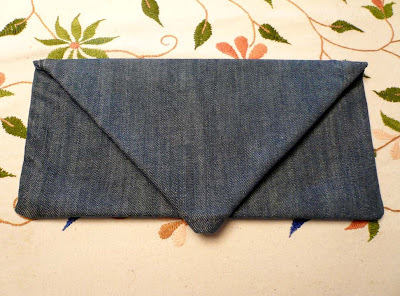 The center should be easy to find, since you’ve ironed your envelope folds into a triangle at the top edge. Step 8: Stitch braided piece into the hem of your bag. 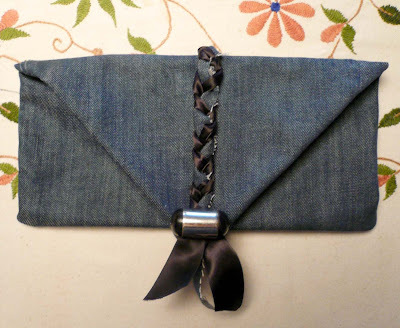 Hand stitch a bead, or button into the front of the bag, at the center, just above the braid. Be sure that the bead is stitched on very loosely. Your braid will have to slip under it to act as the closure to your bag, so you need to have a lot of excess space for it to fit underneath. 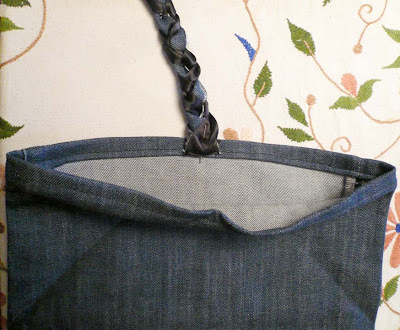 Fold the top part of your bag back into the envelope shape, and wrap the braid around the back side of the bag, so that it comes up over the top edge, and back down the front. Insert the braid behind the bead at the front of your bag, and…. You’re done! Your clutch is ready for some rock n roll action! *Jessica Taft Langdon is a Brooklyn-based designer, writer & photographer. Check out her personal blog is it the first.